Shandong Tiancheng Chemical Co.,Ltd is the lead manufacturer of Alkyl Ketene Dimer AKD Wax in China . Since 2008 , Tiancheng quality and quantity have been ranked top in the world, during we adopt the advanced production equipment and production technology , our quality is more and more best , the purity higher 90% . the output quantity reach more than 40000 ton per year .Alkyl Ketene Dimer(AKD WAX) which is made of high fatty acid (≥12) .This is acylated and dehydro chlorinated . 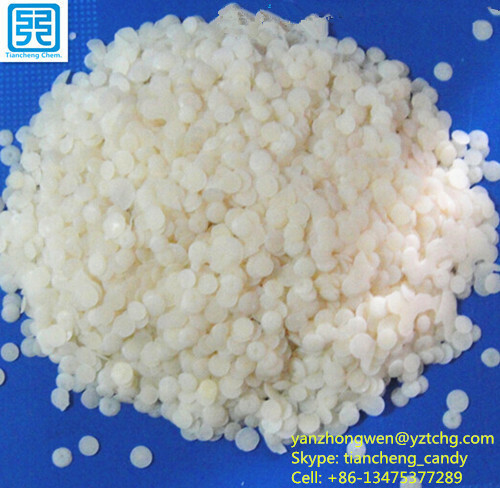 This product as a kind of initial powder of neutral sizing agent, is used in making neutral sizing agent latex of paper pulp . After sizing with AKD emulsion, it can make paper less water absorbing and controls its printing properties. Our company produce a series of paper chemical including AKD emulsion , Surface sizing agent , Wet Strength Agent (PAE) ,Dry Strength Agent (PAM) , Retention aid ,Lubricant , Fixing Agent ,surface agent , Cationic Reagent (PTAC) ,polymer emulsifier , AKD Emulsifier , special strach for AKD , Zirconium Oxychloride , Dispersant , Curing Agent (polyDADMAC) ,Bactericide ,Defoamer,Water Repellent Agent, Wet strength release agent,Theology modifer,etc. In the papermaking process, application of AKD sizing agent gives the fluid resistance to paper and paperboard to prevent or delay the penetration and diffusion of some liquids on paper fibers, thus satisfying people's requirements on the processing and use of paper products. Tiancheng Chemical is one of the drafters for National Standard on AKD wax. With a twenty-year history of production of AKD wax, it has been devoting to the quality improvement and R&D. We are not only the manufacturer of AKD wax, but the user. This helps us to deeply analyze AKD wax, and to mature and stabilize the production technology of AKD wax. Tiancheng Chemical continuously extends its AKD wax industrial chain to the front end from AKD wax to chloride to phosgene, in order to realize the integrative production mode. by AKD wax can has high active contents and good emulsification effect. 3) Reduce the possibility of wax points on paper, reduce paper sliding cylinder and roller sticking to guarantee the normal running of the paper machine. 4) Effectively prevent sizing reversal and false sizing phenomenon. The production process of Tiancheng AKD wax adopts DCS automatic control; Adopt imported equipment, such as French De Dietrich reaction kettle, German SIHI vacuum pump, Kroll injector, E+H flow meter and control valve; Adopt the fully automatic packaging lines and pile up by the robot. After-sales service team of Tiancheng Chemical has rich experience in production and application of AKD wax and AKD sizing agent, and serves to the papermaking industry for many years. The team not only solves production problems of AKD sizing agent for customers, but provides application technical support for customers to eliminate customers' worries. Looking for ideal 1865 AKD Wax Manufacturer & supplier ? We have a wide selection at great prices to help you get creative. All the AKD Wax for Sizing Agent are quality guaranteed. We are China Origin Factory of AKD Wax. If you have any question, please feel free to contact us.